You won’t find an elaborate activity calendar on the Care Haven website. Our activities program is highly individualized – we couldn’t squeeze a list of all we do in a month onto just one page! An activities program for seniors with dementia shouldn’t be a collection of random recreational diversions. We tailor ours to match residents’ individual interests, preferences and abilities. Our goal is to preserve their confidence and self-worth. Click each entry in the list below to learn more about our Care Haven activities program. Our Activities Assistants visit each of our Care Haven homes throughout the week, often playing piano and musical games with residents. They also guide group balance workouts, exercise routines and relaxation sessions. They’ve even been known to start up a hearty round of beach ball toss, fly swatter balloon, counter bowling or magnetic darts. Not all of our music & movement activities take place in a group setting. 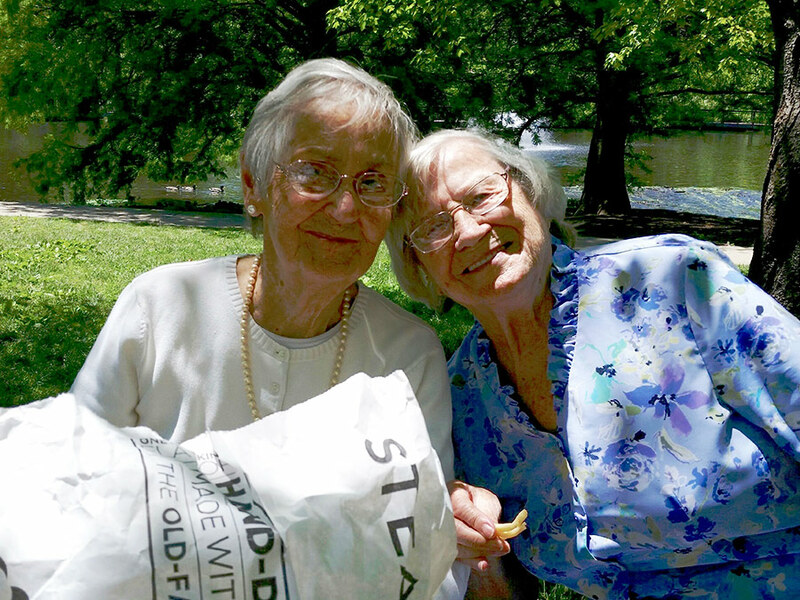 Our Activities Assistants leave plenty of time for one-on-one interactions: an individual exercise session for the resident who needs special guidance or encouragement, a stroll around the neighborhood with an avid birdwatcher. With a small group of no more than eight residents, it’s easy to keep everyone together – and to be flexible if someone feels restless or out of sorts. Our residents take shorter, less formal trips with caregivers, too – each carefully tailored to their individual interests, abilities and comfort zones. Several might enjoy a treat at the neighborhood ice cream parlor, or one may accompany staffers on our weekly shopping trip to the warehouse club. Sometimes a couple of our residents just want to spend a little time outside of the house – a member of our staff can take them on a pleasant drive around the city. We’re also happy to arrange transportation for the occasional personal shopping trip or outing. Many a senior’s most faithful companion is furry and four-legged. In return for regular meals and loving attention, a pet has mysterious ways of caring for Mom or Dad. Our Operations Manager, Jeannine, drives the most popular member of our management team to work each day. Jake is a big, black goldendoodle: half golden retriever, half poodle, and all heart. He makes the rounds of all our homes. He attends to each resident. A whistle from Bill, and Jake quietly sits for his morning pet. A word from Toni, and Jake is at her side, guarding the patio from chipmunks. He can start a somber household laughing by patrolling the yard for squirrels. He senses when someone isn’t feeling well and quietly stands watch at the bedside. A large portion of our activities program is so much a part of our day-to-day Care Haven routine that it doesn’t require a formal plan. If you visit at lunch, you might find a caregiver reading to residents from the day’s newspaper and leading a discussion of current topics. Another day, she might turn to The Daily Chronicle to trigger memories of events that occurred on that date in history. She knows to bring out a puzzle to help a resident interact with visitors – and to start a card game with other residents to make it easier for those visitors to leave. 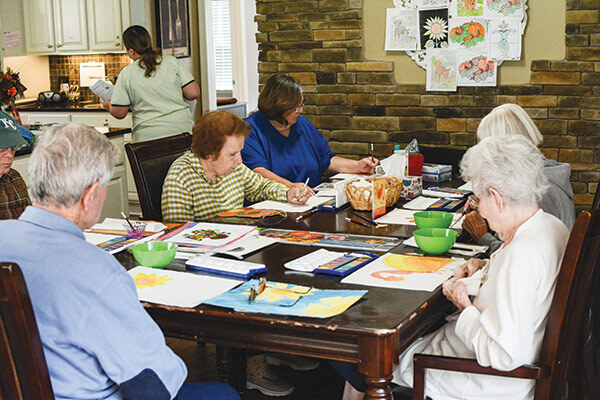 The Operations Manager, Activities Assistants and caregivers of each home work together to integrate a series of meaningful, individualized activities into each resident’s daily life. They consult family members to discover, and then encourage, a resident’s favorite pastimes and passions. For one resident, that may mean helping with the gardening. Others would rather put up seasonal decorations – help with the gardening – assist with meal planning – join in the weekly household shopping trip – prepare a salad for lunch – set the table for dinner. 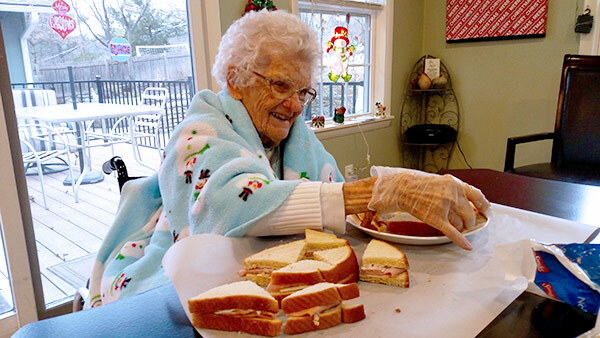 The only “cookie cutter” activity in a Care Haven home involves baking in our kitchen! Care Haven’s activities assistants see that all our residents spend their days doing what they enjoy. They find ways to fill the days with favorite pastimes. They encourage a sense of camaraderie, too, bringing people with common interests together. I had a 28-year career with Kansas City Power & Light. Early on, I realized that I enjoyed people a lot more than machines. And, of course, raise my son and babysit 2 grandkids and 1 great grandson. After I retired, I found Care Haven Homes. I started as a Care Haven caregiver. I enjoyed working one-on-one with residents, building a special relationship with each. I tried to find a way to make each day special. Which is what recently led me to focus on activities. I now make it my job to keep people busy doing the things they love. I look forward to the laughter that comes with a lively spelling bee or bingo game. I like the challenge of bringing a smile to someone’s face with a special activity meant just for her. I love working with seniors. I have great memories of visiting senior centers with Mom and my siblings – playing the piano, singing and chatting with residents. Since 2005, I’ve worked in the assisted living, memory care and/or skilled nursing field. I’ve planned, organized and implemented activity programs for seniors with a wide range of interests and abilities, becoming more and more focused on developing activities for seniors with dementia. I’m especially interested in complementary health and wellness approaches to health care. For over 20 years, I’ve shared yoga, Reiki (a relaxation and pain reduction technique) and other holistic practices with seniors – always with their doctors’ permission. I’ve also developed more traditional exercise programs that include balance workouts and equipment such as balls and weights. Playing the piano in each home, entertaining residents with sing-alongs and games, watching music touch a place deep inside.